Boy, are these kids interested in our cat Abbey lately! They love to pick her up, and bless her kitty heart she tolerates it. It was funny enough seeing Hayden do it, and I about fell over laughing when I saw Layla waltz up to her and pick her up. 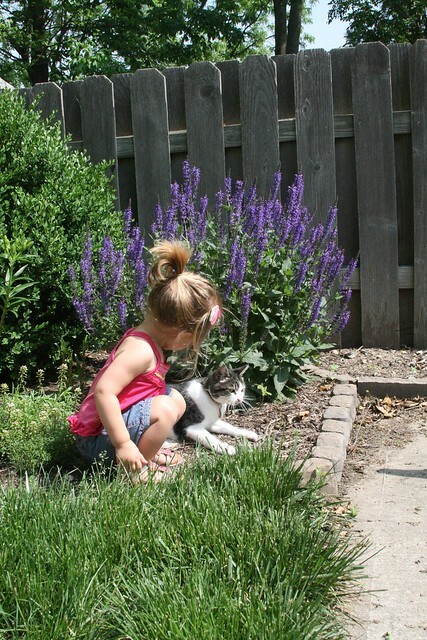 Of course, I rushed over to assist – Abbs is little for a kitty but still a lot for a 2 year old to hold. Hayden is starting to become somewhat of a handful when we go with walks. It breaks down like this. If we take his stroller then he just wants to push it the whole way instead of riding in it. If we even touch it then he gets cranky at us and has a mini fit. Attempting to put him in the stroller without his written permission – parental suicide! Sometimes he’ll change his mind half way on the wall and start to climb in the stroller, and then he will either just want to play straps, or might let us push him the rest of the way depending on his mood. Well I’ve started to have enough of this. While I’m pretty patient, if I’m on a walk I do actually want to walk a little bit rather than crawl along, and if we have the dogs they defiantly get very restless and will just start pulling so I want to shake his habit. So the other day we tried to go on a walk without his stroller. The first big mistake was to go out through the garage, so he immediately walked over to his “trailer” and started to push it and told me to open the garage. I tried to explain to him that today there was no stroller – it was clear that one of two things was going to happen. We were going on a walk with the stroller, or we were not going on a walk and Hayden was going to scream and roll around on the floor for twenty minutes. He loved the walk by the way – he likes to grab the dogs leash and walk them – he thinks it’s the funniest thing in the world! !